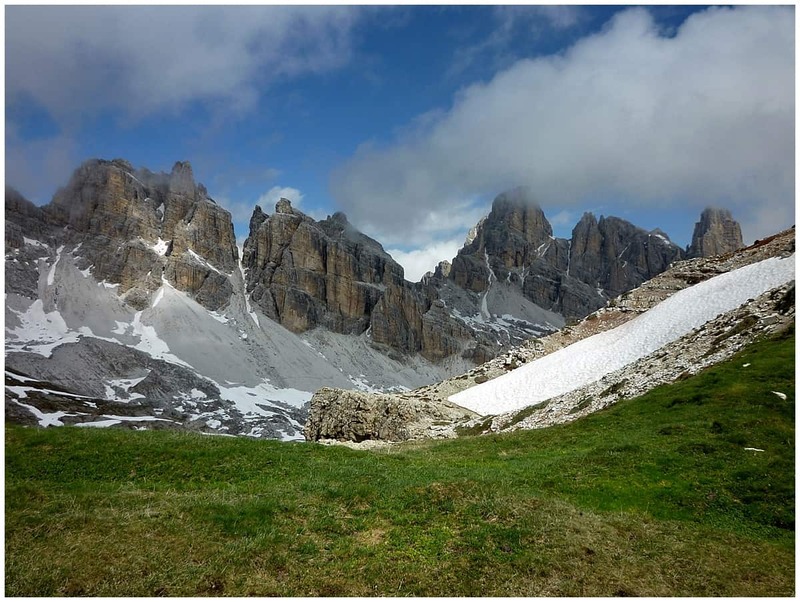 The Dolomites in Italy form one of the most beautiful mountain ranges in the world. That’s not a secret. But they also mark the birthplace of the soft adventure sport via ferrata, a victory of human ingenuity over a violent past. The cloud disappears, leaving clear air ahead of me. Clear air ahead, clear air behind and, as my mind and stomach spin, I see clear air below. Over 2000 metres of it in fact, a gaping emptiness between the rocky ledge my toes perch on and the distant, twisting roads of the Ampezzo Valley. My hands grasp the cable that’s bolted into the rock, while my pulse tries to ignore the knowledge that my heels rest on nothing. This isn’t rock climbing, it’s via ferrata, and I’m chasing clouds in the Dolomites. It all started this morning, as I tightened my helmet and settled in to my harness. Experienced climbers can use via ferrata unsupervised, but novices like me need a qualified Alpine Guide. I’m here with Filippo Beccari, a quiet yet confident Italian, who’s somehow managed to convince me that the intermediate route, rather than the one for beginners, would be a good idea. The grass is still wet from the early morning dew and the clouds track across the sky in a scattered formation. After a short walk to the base of the Col dei Bos, I spot my very first one: my first via ferrata. Today, this is an adventure sport that’s spread across the world, from Italy to France, Germany, Canada and beyond, reaching a lofty 3800 metres on Mount Kibalu in Malaysia. 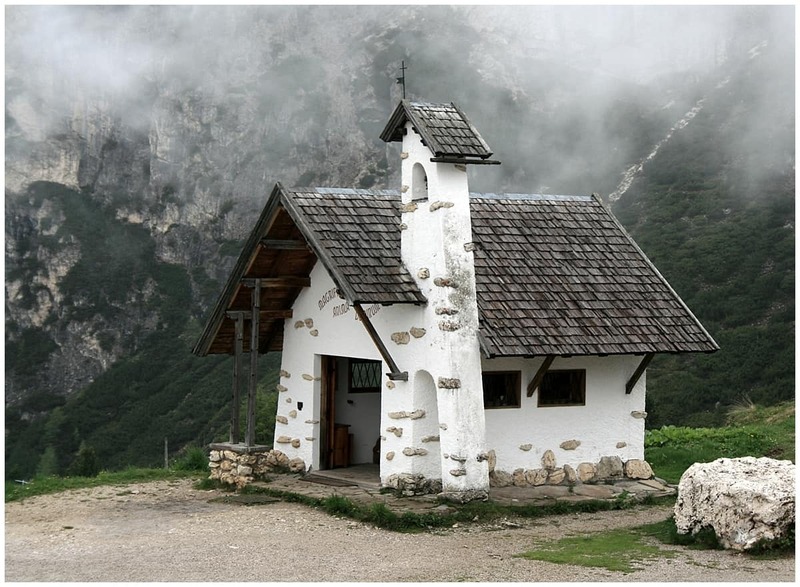 But it all started here in the Dolomites as a way to save lives. When World War One broke out, Italy was in trouble. 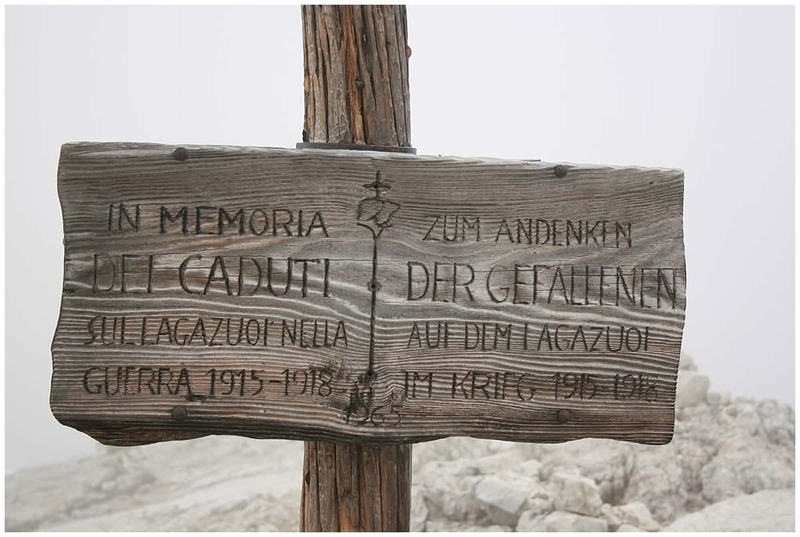 Battles with Austria straddled these peaks, yet Italy’s soldiers knew more about the beaches in the south than the rocks in the north. With no time to train, they devised something else: via ferrata. The name means “iron path” and the concept was simple: drill a cable into the mountain and let people walk, scramble or climb past, clipping on for safety. Fast forward a couple of decades and the Italian Alpine Club had a bright idea. They spruced up the signs, replaced the rusting metal and lo and behold, a new adventure sport was born. A few of the original via ferrata still snake through the grass but these wisps of iron aren’t the only ghosts from the war. The crumbling wall of a hospital forms a silhouette on the horizon, while soot-blackened tunnels reveal where soldiers used to live. I can’t think about that now. I need to focus on getting this right. Via ferrata may be open to anyone in good health, but there’s still a price to pay for getting it wrong. Even with the cable, the braking apparatus, the carabiners and the extra rope that Filippo has fastened to my waist, I don’t want to fall. I don’t fancy dangling in thin air, straining the equipment or scraping along the stone. Metallic clinks mingle with birdsong as Filippo threads our way up. Two lanyards fasten to the cable. When he reaches the anchor points, he unclips one, attaches it beyond the anchor, then repeats the process with the second lanyard. His frame seems feline against the lilac and butter rock, whereas I’m huffing after him like an unbalanced rhino. 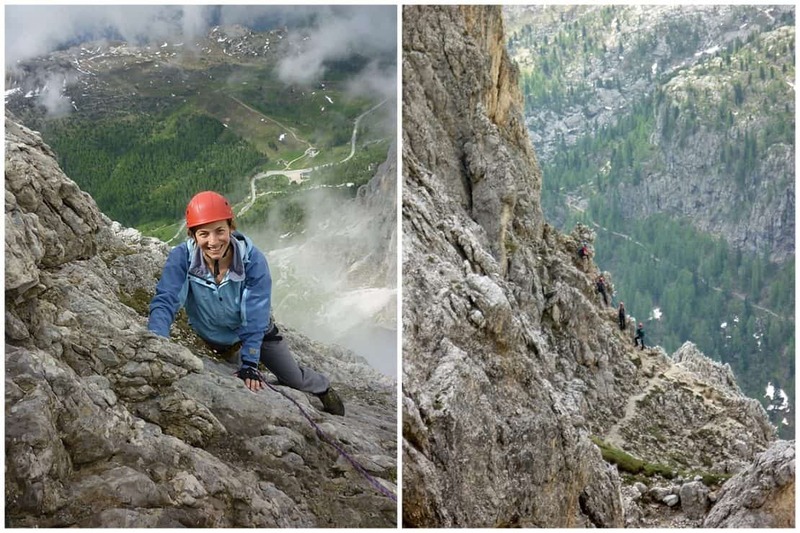 What happens if you get stuck on a via ferrata? This is the closest I’ve come to climbing – reaching, reaching with one arm, fingertips clawing at rock. Knees bent, thighs burning as I reach, reach, wait for it, shift my weight to the next ridge in the rock. After only ten metres, panic knocks at my door. I simply can’t work out what to do next. Can’t go up, can’t go down. Can’t move to the side. I’m stuck, I’m stuck, I’m stuck and I’m a little overwhelmed as I remember that this is only a medium route. I have visions of growing old right here, spread-eagled against the mountain, vultures picking at my bones. I stay silent and do the calculations. Ten metres up. 2559 metres at the peak. This is beyond embarrassing. “Stand on the anchor,” comes the voice from above – and this time reassuring brown eyes stare back at me. Anchor? Ah, the attachment for the cable that underpins the whole sport. It looks rubbery and, well, too flimsy to take my weight. I reach my foot to the right and tap my toes around its edges. My fingernails dig into the rock. Easy, easy, transfer my hips across and – ta da! I’m still alive! From here, the only way is up, as they say, and I’m taking it. One hand here, the next there, use your legs, climb, breathe, smile, enjoy. Soon I’m at a natural plateau, watching those clouds swirl around the limestone peaks and feeling the sun on my face. “The first part is always the hardest,” says Filippo. This is something I’ve never considered before. Progress along a via ferrata is a one way affair. We’re alone now but there will be others later. Unlike rock climbing, there’s no custom route down. There’s one cable, one direction, one chance. I zip up my jacket and press on, letting a rhythm of climbing, crisp air and adventure fill my lungs. From the summit, a mossy path leads the way home, its edges tipped with snow. I’m half way down before I spot tiny figures on the rocks, silhouettes on the via ferrata. Wow, I can’t help but think. I did that. Disclosure – I arranged this via ferrata trip with guide through Dolomite Mountains (www.dolomitemountains.com) As ever, as always, I kept the right to write what I like. 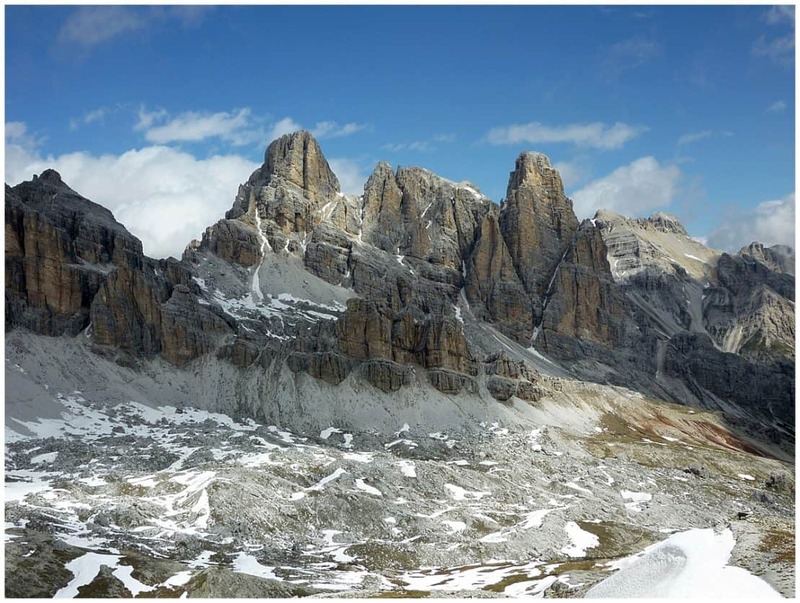 You can reach the Dolomites by flying into Venice, Verona or Innsbruck and travelling on from there. Beautiful writing.. Such stunning scenery, and such a haunting and sad history. Thanks Dee. It’s so sad to think of how many lives have been wasted in combat over the centuries. Yes, I loved it and did do it again before I had to have surgery on my foot. Maybe now that’s healed it’s time to try again… So glad to discover another fan!